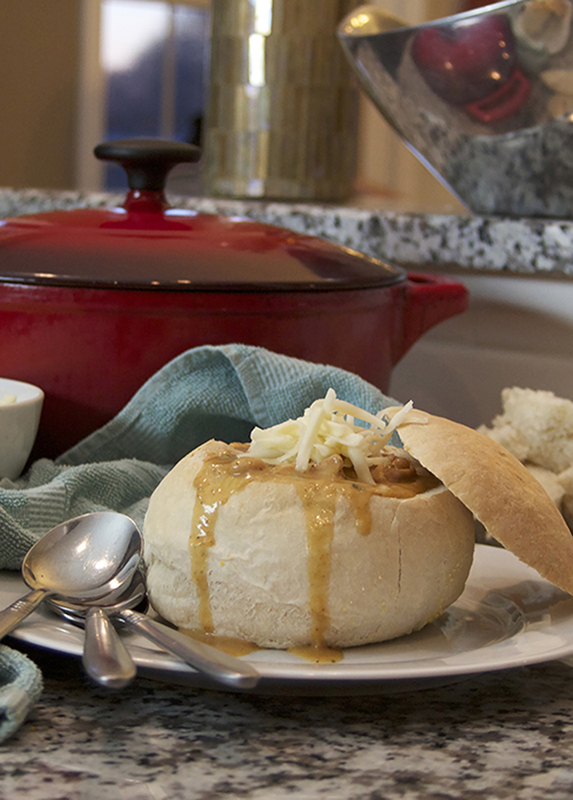 These bread bowls are the perfect vehicle for your favorite soup, chili or party dip. Have water at 80°F and all other ingredients at room temperature. Place ingredients in pan in the order listed. Select dough/manual cycle. Check dough consistency after 5 minutes of kneading. The dough should be in a soft, tacky ball. If it is dry and stiff, add water, ½ to 1 tablespoon at a time. If it is too wet and sticky, add 1 tablespoon of flour at a time. At end of cycle, remove the dough and continue with the Shaping, Rising, and Baking directions below. See our Bread Machine section for more helpful tips and information. Dry mixture: Combine yeast, 1 cup flour, and other dry ingredients. Heat water to 120° to 130°F. Hand-Held Mixer Method - Combine dry mixture and water in mixing bowl on low speed. Beat 2 to 3 minutes on medium speed. By hand, stir in enough remaining flour to make a firm dough. Knead on floured surface 5 to 7 minutes or until smooth and elastic. Use additional flour if necessary. Place dough in lightly oiled bowl and turn to grease top. Cover; let rise until dough tests ripe. Continue with the Shaping, Rising, and Baking directions below. Stand Mixer Method - Combine dry mixture and water in mixing bowl with paddle or beaters for 4 minutes on medium speed. Gradually add remaining flour and knead with dough hook(s) 5 to 7 minutes until smooth and elastic. Place dough in lightly oiled bowl and turn to grease top. Cover; let rise until dough tests ripe. Continue with the Shaping, Rising, and Baking directions below. Have all ingredients at room temperature. Put dry ingredients in processing bowl with steel blade. While motor is running, add water. Process until mixed. Continue processing, adding remaining flour until dough forms a ball. Place dough in lightly oiled bowl and turn to grease top. Cover; let rise until dough tests ripe. Continue with the Shaping, Rising, and Baking directions below. Turn dough onto lightly floured surface; punch down to remove air bubbles. Divide and shape into three round balls. Place on greased cookie sheet covered with cornmeal. Cover; let rise until indentation remains after touching. Bake in preheated 425°F oven 20 to 30 minutes. Spray or brush loaf with cold water several times during first 10 minutes of baking for a crisper crust. Remove from cookie sheet; cool. To make bowls: Cut a thin slice off the top. Hollow out inside, leaving half-inch sides. Placing bowls in a 300°F oven for 10 minutes will dry sides and prevent premature soaking from the soup. Recipe featured at Thyme In Our Kitchen. Thank you for including the different methods of mixing – some days I just don’t feel like dragging out the stand mixer or bread machine (limited counter space!). The bread bowl recipe worked perfectly. I’ve always used Quick Rise Red Star yeast, but this is the first time I’ve used regular yeast from the jar. The dough had a wonderful texture. I can’t wait to try the other recipes. I just wanted to let you know how much I like your Red Star yeast when I’m using my bread machine. I always get great results!! !